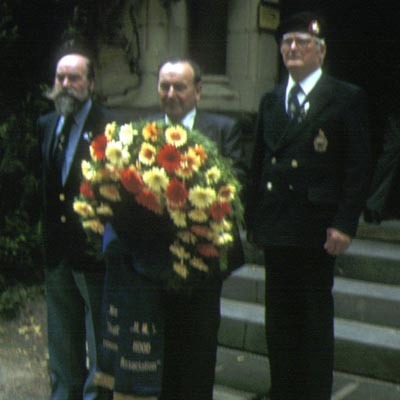 The photos on this page are take from a trip to Germany by members of the H.M.S. Hood Association. 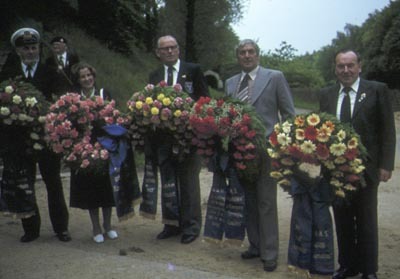 The trip was made during the late 1970s or early 1980s. 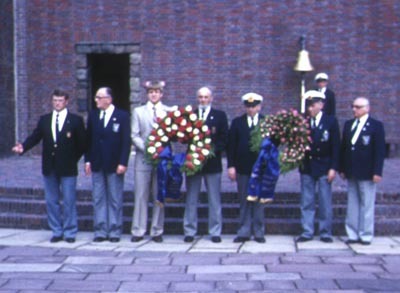 Veterans met up with their counterparts from the Kameradschaft "Schlachtschiff Bismarck" (Bismarck Association). 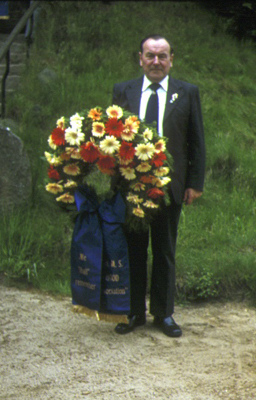 The images are taken from a set of slides held by veteran Ken "Nobby" Clark. Important Notice: These photos are the property of the H.M.S. Hood Association and may not be downloaded and/or used elsewhere without the Hood Association Committee's express permission. 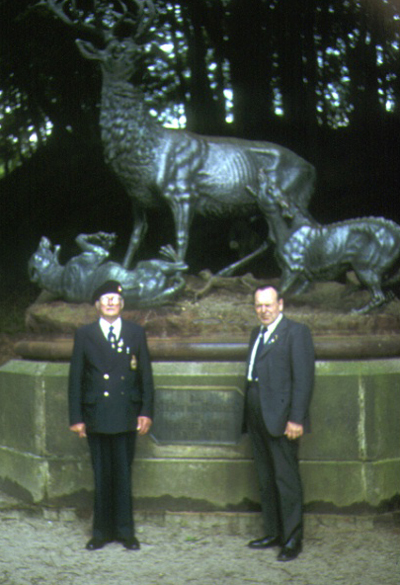 Ken "Nobby" Clark on the right with another unidentified Association member. 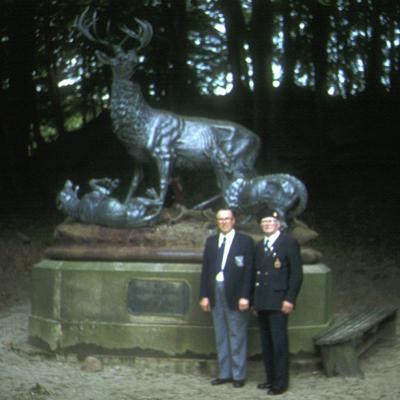 They are standing in front of a hunting statue in Friedrichsruhe, in the Sachesenwald near Hamburg. This statue, as well as the Battleship Bismarck memorial are near the mausoleum of Otto von Bismarck. Nobby must have taken this one. The gentleman on the left is a Bismarck veteran and on the right a Hood veteran. 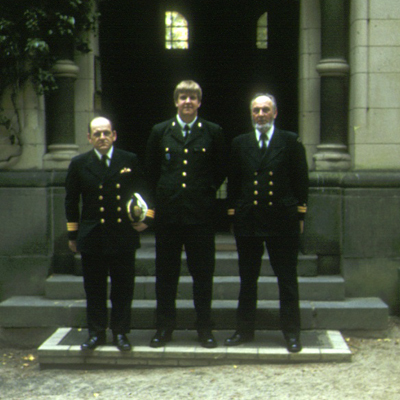 Here we seem to have three modern day German Officers. 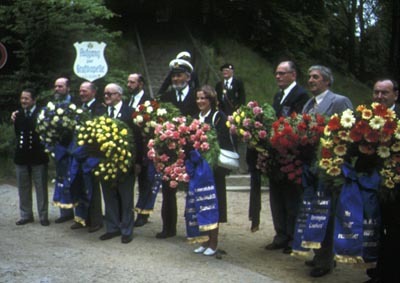 They are standing in front of Otto von Bismarck's mausoleum. 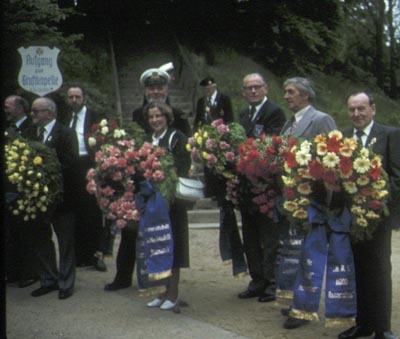 This and the following photos show the massive German wreaths laid at the memorial service at Friedrichsruhe. 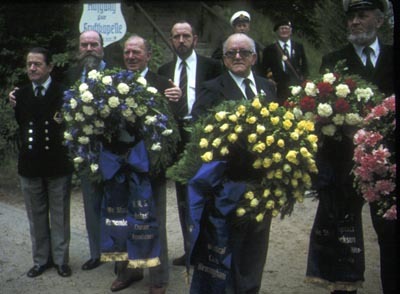 German veterans before the service. 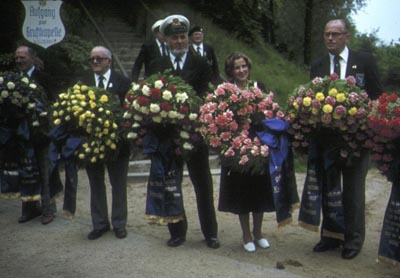 They appear to be at the Hamburg-Ohlsdorf cemetery.